Disney’s “The Lion King” is welcoming three new cast members to the Las Vegas production at Mandalay Bay. South African native Phindile Mkhize will take the stage as Rafiki on July 4. She has toured with “The Lion King” for eight years and traveled to Germany, Australia, Holland and Amsterdam. 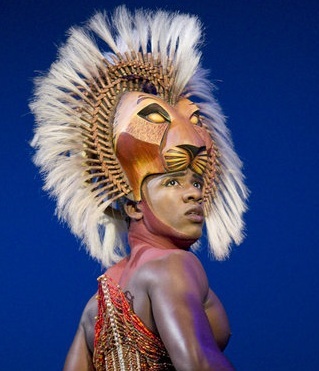 Dashaun Young began his role as Simba in Las Vegas on June 23 following performances in London, Broadway and the National Tour. Broadway newcomer Samantha Ware debuted with “The Lion King” on June 13. Ware hails from Lincoln, NE, where she was a student at Doane College. Mandalay Bay’s production of The Lion King debuted in May 2009. Within nine weeks, it broke the resort’s box office record. The Musical Lion King is a Standing Production In Mandalay Bay Theatre Las Vegas. Use Code AFF$10 to Get $10 OFF on Lion King Las Vegas Nevada Ticket Orders over $350! 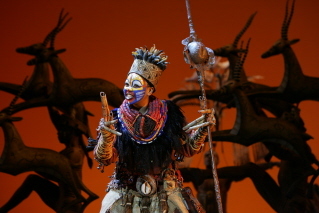 On Broadway, Lion King grossed $1,748,215 with 100% attendance rate for the week ending June 26, 2011. The 30 shows on the boards grossed $23,765,758, increasing nearly 4% from the previous week’s totals. Below are the Top 13 Grosses for the week ending June 26, 2011. The Lion King is expected to have a local economic impact of more than $15 million during its four-week run that begins on Monday, June 14 at the Schuster Performing Arts Center, according to Dayton-area arts officials. Restaurants, parking lots, hotels expect to enjoy brisk business during Lion King musical’s run. The Victoria Theatre Association last week had sold more than $5 million in tickets for “The Lion King’s” 32 performances, said Ken Neufeld, president and chief executive. About 9,000 Lion King Schuster Center tickets were still available from a total of 72,000, Neufeld said. He expected to sell more than 70,000 tickets by the end of the show’s run on July 10. On average, Broadway tours generate an economic impact of 3.5 times the gross ticket sales to a local metropolitan area’s economy, according to The Broadway League, a national trade association. “The Lion King” will bring 2,200 people downtown for each of eight shows per week. Restaurants, bars, hotels and parking facilities are among the top beneficiaries, Neufeld said. Uno’s Chicago Grill on North Main Street expects its best four weeks in several years because of theater crowds, said Joe Kiley, general manager. “From last week to this week, we will double in sales for ‘Lion King,’ ” Kiley said. Citilites Restaurant & Bar at the Schuster Center anticipates full dining rooms before all performances, including matinees, said John Miller, director of food and beverage services. Jay’s Seafood Restaurant in the Oregon Arts District saw its business spike in June 2010 as result of “The Phantom of the Opera,” which did $2.3 million in local ticket sales, said Amy Haverstick, owner and general manager. “My weekday business is definitely increased because of the shows,” Haverstick said. “Lion King” patrons will fill two theater-district lots operated by Parking Management Inc. for all shows, said Paul Hutchins, the company’s owner. The production will bring more than 100 people to Dayton, including actors, crew and management. They will stay in area hotels for four to five weeks, resulting in nearly 3,500 hotel room nights occupied, Neufeld said. Hotels also will benefit from tourists in town to see “The Lion King.” Neufeld said 10 percent of audience from “Wicked” came from outside the eight-county area surrounding Dayton. “The Lion King” will employ 34 local union stagehands and eight musicians for each of 32 performances and one dress rehearsal. About 100 stagehands are employed to load the production both in and out of the theater. “That money all stays in the community and gets spent where we are,” Neufeld said. During their off hours, the touring cast and crew frequent area restaurants, movie theaters, and grocery and retail stores, further fueling the economy. Buy Lion King Schuster Performing Arts Center Tickets Online. Use Code AFF$10 to Get $10 OFF on Lion King Dayton OH Ticket Orders over $350! The Tony Award-winning musical “The Lion King,” which opened on Broadway almost 14 years ago, will leave its first paw prints in Dayton, Ohio beginning Tuesday, June 14. Musical theater fans in Dayton have waited a long time for the Lions Show. By the time the production’s North American tour packs up its 18 semi truckloads after the 32nd performance in the Schuster Center on July 10, more than 74,000 ticket buyers will have paid $5 million to see it. They aren’t the only ones who think it’s still worth waiting for. “Lion King” has been neck and neck with “Wicked” all spring as Broadway’s top draw in New York and on tour. For the week ending June 5, “Lion King” was second only to “Wicked” in box office receipts among 32 Broadway shows — $1.7 million to $1.65 million. To promote the business, the Downtown Dayton Partnership and Victoria Theatre Association have coordinated “Roaring Deals” packages with more than two dozen restaurants, bars, retail, service and hospitality businesses during the presentation. Buy Lion King Dayton OH Tickets Online. Use Code AFF$10 to Get $10 OFF on Lion King Schuster Performing Arts Center Mead Theatre Ticket Orders over $350! 13 new cast members have joined Disney’s The Lion King at the Lyceum Theatre. Liverpudlian actress Ava Brennan makes her West End debut as ‘Nala,’ having recently played this principal role in the Hamburg production. Damian Baldet , who has worked at La Jolla Playhouse, Soho rep and the Ensemble Theatre of Cincinnati, comes fresh from the Las Vegas production to play the role of ‘Timon’. Jacquelyn Hodges joins having also performed in the Las Vegas production and in the North American tour, to play the role of ‘Shenzi’. In addition, Sebastien Torkia will play the role of ‘Ed’. Previous West End credits include Saturday Night Fever, A Streetcar Named Desire, La Cage Aux Folles and Guys and Dolls. New ensemble performers: Curtis Lee Scott, Cleveland Cathnott, Francisco Lins, Wade Lewin, Darcel Frederik, Aisha Jawando, Momo Yeung, Jose Alves and Jamie Golding who will contribute to the international company which already includes performers from 16 countries around the world: UK, Canada, USA, South Africa, Jamaica, Japan, Germany, Holland, France, Mexico, Australia, China, Taiwan, South Africa, Singapore and Korea. The show continues to feature Shaun Escoffery (Mufasa) and George Asprey (Scar). More than 9 million people have now seen Lion King at the Lyceum Theatre. Buy Lion King London GL Tickets Online. Use Code AFF$10 to Get $10 OFF on Lion King Lyceum Theatre Ticket Orders over $350!